The three A’s of physician success are availability, affability and ability. In this order. It speaks to what patients see as the most important attribute of a physician. Capacity and competence take a back seat to who happens to be around when you’re in need. To some it sounds short-sighted. But it works because average physician know how serves the average patient well. But for the patient with an above average problem, convenience should be a far second to finding and waiting for the most able mind possible. This is the exception that most patients overlook when seeking treatment. 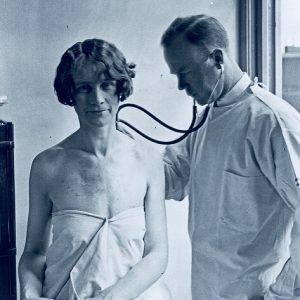 Doctor and patient in City Hospital Tuberculosis Division, 1927. Item 2721, Engineering Department Photographic Negatives (Record Series 2613-07), Seattle Municipal Archives. Color modified.